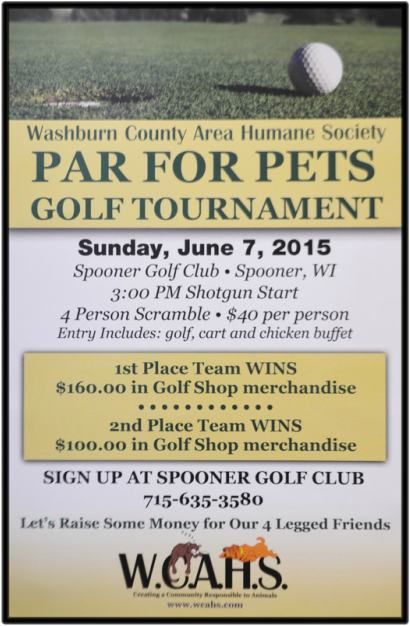 The annual “Par for Pets” golf scramble fundraiser for the Washburn County Area Humane Society is swinging into play on Sunday, June 7, at the Spooner Golf Course, with a shotgun start of 3 PM. There will be a $40 per person registration fee which will include 9 holes of golf, use of a golf cart, and a broasted chicken buffet. This is definitely a day of golfing fun for everyone of all ages and skill levels, so singles, couples, and teams of men, women, and kids are all welcome to take part in this very worthy charity event. Put together a team yourself or just come out on June 7th and join up with other golfers. Pre-registration is encouraged and may be done by calling the golf course at 715-635-3580; however, golfers may also register beginning at 2 PM the day of the event. There will be a variety of golf prizes, raffles, and games both on the course and in the clubhouse that day. What better way to spend a nice Sunday afternoon and also do a wealth of good for the community’s animal shelter. This is an all-around, feel-good deal--golfers enjoy the game, winning prizes, eating well, and the WCAHS shelter enjoys the benefits from their enjoyable day on the golf course! What a “stroke” of good luck for all!